Ex-England fly-half Rob Andrew says rugby union's image has "changed completely" since Twickenham hosted the Rugby World Cup final in 1991. Cambridge University graduate Andrew appeared at three World Cups, including playing in the 1991 final. "Rugby was perceived as a private school, university sport but that has changed," he told BBC Look East. "Anybody from any background can get involved in the sport now. That's the change it has seen over 20 years." 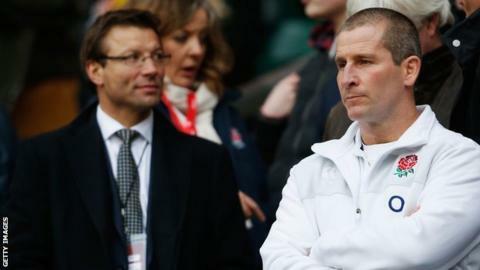 Andrew, 52, enjoyed a successful club career with Wasps and Newcastle, before going on to become the Rugby Football Union's professional rugby director. Speaking in the run-up to this year's World Cup being staged in England, Andrew was keen to stress how the sport was now more inclusive than in the past. England will face Fiji in their opening Pool A fixture, and Andrew believes coach Stuart Lancaster will have some tough decisions to make. "[Rival fly-halves] Owen Farrell and George Ford have been destined to be in this position for some time," he said. "They first played for England together at Under-16 level. "They're great friends and rivals, and Stuart Lancaster will have to make that selection call at the right time. "But it's not just a 15-man game any more, it's a 23-man game. "Over seven weeks of intense competition the team with the strongest squad will be really well set. I think we'll have a strong squad." "There was a big boost in France after the 2007 World Cup, both in the professional game and in the growth of French clubs. "It has been 24 years since we last hosted the World Cup and it could be another 24 years until we host it again. "Getting more people involved in the rugby family is important. Young and old, boys and girls, not just players but referees and coaches as well. "People are making friends through rugby, and once rugby's in your blood you can't get rid of it. People are very welcoming. "This will undoubtedly be the biggest World Cup there has ever been, with 48 matches virtually all sold out. If the team can get on a roll, then it will dominate sport in this country." "I was there in the 1991 World Cup and we were amateurs. We played in the World Cup final on Saturday and were back in the office on Monday morning. "I was lucky to play my part when I did. I think we'd all have liked to have had a go at professional rugby just to see what it was like, but I loved every minute of my playing days. "You look back and reminisce about the journey. "When I played it was even more brutal. It's actually a safer game now at the top end than it has ever been. It's physical, but player welfare issues are at the top of our agenda."